Dec. 31, 2018. The Small Hall at the Cheonseong Wanglim Palace. We are grateful to report our victory to Heaven in the 6th year of Cheon Il Guk (CIG), 2018, and would like to give a round of applause to True Parents. The beginning and the end are very crucial. It started with Heavenly Parent and True Parents, and it also ended centering around Heavenly Parent and True Parents. 2018 was a very important year. The history of 3rd stage of the Cheongpyeong Providence began under True Parents’ direct dominion on Oct. 27, 2014; it was 4 years on Oct. 27, 2018. So now the 5th year has started. If you reflect on 2018 as a whole, it was a year that Cheongpyeong Training Center was at the front line of the providence centering on True Parents’ teachings of divine spirit and truth. It was also a year for us to experience amazing heavenly works and miracles as we followed True Parents’ teachings. The Korean Church (KC), as the vanguard, marched forward with divine spirit and truth and showed us a great example. 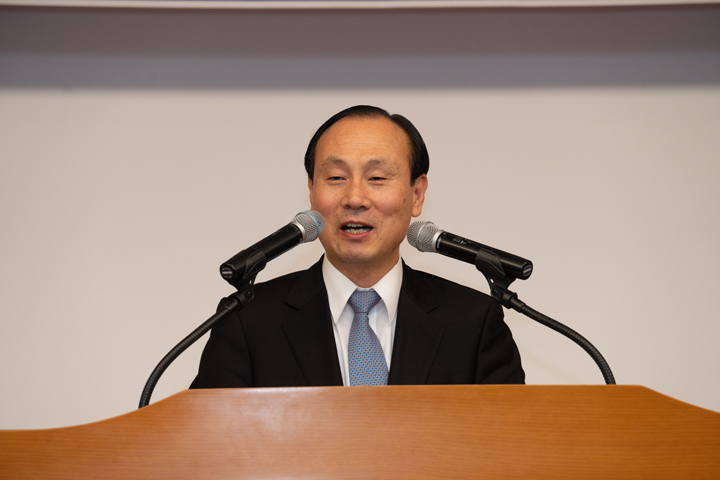 The 2018 Hyojeong Cheongpyeong Korean Church Tours (KCTs) were the hottest-ever events, in the 47 years of Cheongpyeong history since 1971, with its works of the Holy Spirit. Along with the KCTs, the world tours were also held actively. Looking back on these, the spiritual atmosphere was different from before 2017. In 2018, we toured around the world, including Cambodia (May 28~29) and Nepal (Aug. 18~19), and we experienced very strong and miraculous spiritual works with a completely different spiritual atmosphere. As the father nation, Korea became a central country and root for the world, so the works starting from Korea spread to the world spiritually. Even during the Japan Tours, there were many amazing miracles that were different from before. The America Tours were able to bring the American family back to life and motivate them to start anew through New York (July 28~29), Washington (Aug. 4~5), Las Vegas (Oct. 27~28), and Chicago (Nov. 3~4). Right after the Seonghwa Ceremony (Seonghwa Festival Commemorating the 6th Anniversary of the Holy Ascension of Sun Myung Moon, the True Parent, Aug. 27), True Parents asked 700 world leaders to directly join the Hyojeong Cheongpyeong Special Workshop (WS) for CIG Leaders Hosted by True Parents, which was held from Aug. 28 to 30. The content of the WS was only about chanyang and prayer. True Parents also asked them to restart from a pure childlike position regardless of whether they are high or low, by letting go of everything. World leaders were recreated for 3 days. Following True Parents’ guidance, “Repent and start anew”, there has been an amazing grace from Cheongpyeong Works (CW) throughout the world. The Resolution Rallies for the Hopeful March Forward of the KC have also brought forth amazing and miraculous works throughout the country. On this foundation, True Parents gave the CPTC important guidance to hold on the way of the providence. It was the providence of the Branch Training Centers (BTCs). True Mother made a lot of sincere devotion and has huge expectation for the providence of the BTCs. It’s the CheonBo Won that connects with the providence of the BTCs. Those who have fulfilled the mission of the heavenly tribal messiahs to bless 430 gen. of ancestors vertically and 430 couples horizontally will be listed as CIG citizens. Blessing 430 gen. of ancestors vertically is only possible through CW. So, True Parents decided to advance the providence of the BTCs in 4 regions and now it is proceeding very quickly. True Parents asked each of the 4 BTCs presidents to hold their inauguration ceremony in January 2019, as well as a WS for ancestor liberation (AL) and ancestor blessing (AB). 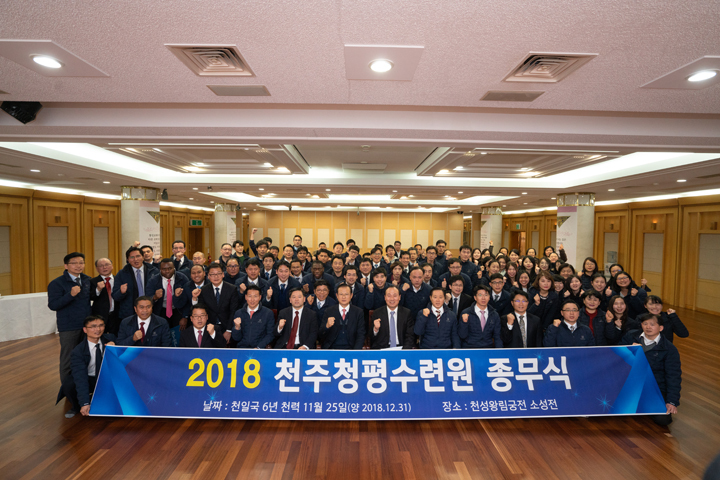 During the last Hyojeong Christmas Festival with True Parents (Dec. 25), 24 people were selected by lottery out of 800 participants and received holy items which True Parents used. There were surprising things that happened there. 3 of the 8 lecturers and supervisors for the BTCs were selected to receive the gifts, thanks to the guidance of True Mother’s spiritual grace. I think it was heavenly fortune and blessing that encouraged them to go out to their areas with True Mother’s love, to work hard under any circumstance and overcome, no matter what difficulties arose. Centering around this providence, we have been marching forward in 2018. 2019 is an even more important year. As it is the last year before Vision 2020, there will be amazing activities externally, not only in the KCs, but also around the world. CW based on AL and AB will take the central position of internal activities.